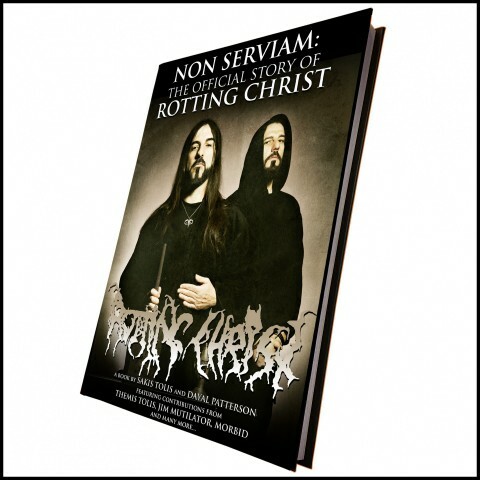 After three years in the making, "Non Serviam: The Official Story Of Rotting Christ", which explores three decades of the legendary Greek extreme metal band Rotting Christ, is to be out on November 30 via Cult Never Dies. Totaling 300 pages and including over 150 photos, many previously unseen, the book was created by none other than founder and frontman Sakis Tolis and Dayal Patterson (author of "Black Metal: Evolution Of The Cult", "The Cult Never Dies Vol. One" and "Into The Abyss"). As well as featuring a brutally honest account from Sakis himself, the book also includes extensive interviews with key members such as brother Themis Tolis, co-founder Jim Mutilator, Morbid and George Emmanuel, as well as words from many of the band’s peers, including members of Enslaved, Behemoth, Mayhem, Cradle Of Filth, Blasphemy, Mystifier, Moonspell, Macabre Omen, Septicflesh, Death Courier, Tiamat, Immolation and more. Noizr Zine had the opportunity to ask some questions to the creators of the first biography for the legendary Greek act Rotting Christ. We spoke with both the band’s leader Sakis Tolis and journalist & writer Dayal Patterson about the book’s writing process. Dayal, there is a wide variety of bands that have existed since the dawn of black metal what is it about Rotting Christ that chose you to write a book about them specifically? Dayal Patterson: A large part of the motivation was the fact that they have undergone a pretty epic 30 year journey, evolving their sound and approach constantly – there’s really a lot to talk about, even if one just looks at the band’s discography, in terms of music and motivations. But there is also a very interesting band dynamic present, with an often creatively-conflicted relationship between the two brothers and at least two points in the band’s history where significant line-up changes had to be made in order to save the band. I think that the musical and human stories made the book project attractive, along with a third aspect, and that is the band’s wider musical impact: One cannot underestimate the impact of Rotting Christ on Greek metal, and part of this book is a wider examination of how they helped kickstart the underground metal scene in the country in the late 80s and early 90s, with members of bands like Necromantia and Septicflesh helping to paint this picture. In a broader sense, Rotting Christ are one of the very few bands who existed before the second wave black metal explosion that have continued to this day, and they have a very unique first-hand understanding of the genre, and of underground metal in general. Having extensively covered black metal for numerous books and articles, Dayal, what do you think sets Rotting Christ apart from the wider 'tradition' of the Scandinavian scene? 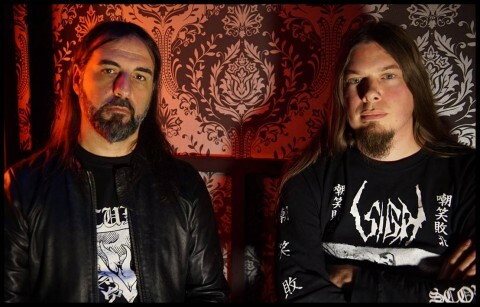 Dayal Patterson: Rotting Christ are largely responsible to what is now understood as the 'Greek black metal sound', a warmer, more mid-paced approach to black metal, featuring more heavy metal influences (as opposed to thrash ones), a more archaic and occult ambience and a certain approach to melody. The fact that the band were one of the first to form and find success – not to mention the fact that the group had their own studio where almost all the other Greek bands recorded – meant that their impact was significant. And in a cultural sense, coming from Greece, Southern Europe, has undoubtedly left its own impact – it is much harder to be a full-time band in Greece than, for example, Norway or Sweden, and the band have faced many additional struggles because of this. Who’s idea was it to document Rotting Christ’s history — Dayal or Sakis? Sakis Tolis: I always had a voice somewhere in the back of my mind about narrating some of the stories I have experienced with my band over those 30 years on the road – a voice and idea that Mr. Dayal Patterson woke and transmuted into reality. Dayal Patterson: Ah, mine of course! This idea came up not so long after I started writing "Black Metal: Evolution Of The Cult", which had a chapter devoted to the band. 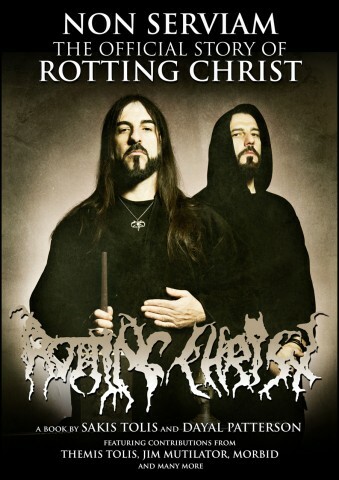 Writing that, it was obvious that the story of Rotting Christ went far beyond the boundaries of the black metal genre, and far beyond what you could tell in a single chapter. So over the next year or so I would mention the idea to create something more substantial to Sakis, and it was an idea that interested him, but which he felt might be unrealistic to realise. In 2015 he decided to give this a chance and so we began work on what became the "Non Serviam" book... three years later, here we are! How did you find the writing process with each other? Sakis Tolis: Dayal reincarnated my memories into reality. It took time indeed… sometimes I was not in the mood to talk I admit, but in the end I found it a new and interesting experience. I felt really well speaking to this man. Dayal Patterson: It was a challenge — I don’t think I have ever worked so hard and for so long with a single musician. And it took a long time to get Sakis to speak more openly and move away from the more stock answers that musicians end up giving unconsciously when asked the same questions by journalists for several decades. It is also worth pointing out that although Sakis is the main voice of the book, there are a number of other important witnesses in the book, including the other two co-founders, ie. his brother Themis (who refused interviews for the last 30 years), Jim Mutilator (who has basically been silent since leaving the band in the mid-90s). You also have other members, such as Morbid and George Emmanuel, as well as peers of the band from groups such as Moonspell, Cradle Of Filth, Watain, Mystifier and many more. 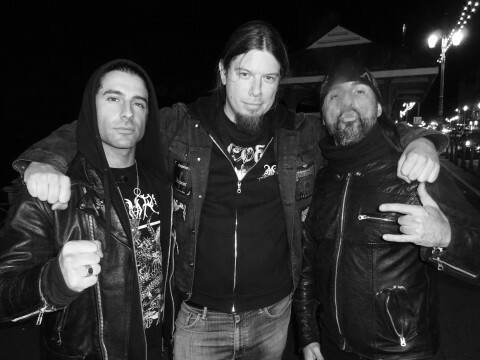 Sakis, how was the experience of delving into Rotting Christ’s history? Were there any particular parts that were hard to discuss or cover? Sakis Tolis: It was a brand new experience, away from the experiences I have had with music and the scene, and the metal business in general. I definitely had to face some of my demons, especially those that were whispering for many years: Does it make sense to go on? Does it make sense to keep on sacrificing a part of your life for music? But Dayal helped me to kill them with the countless hours we spent talking about the history of the band, and created a book that reflects the history of one band that has been here in the scene since day one, and helped me to realize that maybe this was the purpose of this life. It was a useful psychotherapy, one that helped me to know myself even better. Of the bands that have collaborated in the book, Dayal, were there any opinions or stories that you were shocked or surprised to learn of? Dayal Patterson: The stories of the band’s time on tour with bands like Watain are certainly very entertaining, but I think the memories of those early days, from members of bands like Necromantia, Septicflesh, Tiamat, Death Courier, and others, really are very enlightening. This era before black and extreme metal had really broken through to a larger audience, it was almost another world in many regards, and I think for both those who were and were not there it is fascinating to revisit it. The book will be filled with a vast number of photos from across Rotting Christ’s career, was it difficult to find enough pictures? Where were they sourced from? Sakis Tolis: It was a totally refreshing process to return back to analogue times! What a nice, smooth and romantic era… I think we all needed this refreshment. It was hard to collect these images but made sense to do so, especially to help the new people to realize that people were living before the digital era! Dayal Patterson: It was very hard, as it always is when trying to find images from before the ‘digital revolution’ in the mid-00s. No one knows where the negatives are any more, and sometimes not the prints either, and the only scans are usually tiny, unprintable JPEGs. It was a very long process, one that was helped by Jim Mutilator and a friend called Manolis Ev, as well as a lot of other fans and friends of the band. Many have the opinion now that books are a dying art form, especially in the era of YouTube and social media articles. What do you think books have to offer that isn’t provided by more common and 'digestible' media that is abound nowadays? Sakis Tolis: Because I believe that books keep the spirit alive, keep the humanistic attitude that we have so much forgotten as beings… and perhaps it could be the only historical proof for the future generations after, let’s say, a possible digital technology catastrophe. Dayal Patterson: In a word, depth. To me books are the other side of the coin to online articles, in the same way that vinyl is the other side of the coin to online music. Both have their place of course, but by definition you are not going to find 80-90,000 words about a band in any form of 'digestible media'. "Non Serviam" is actually the 10th book published on underground metal by Cult Never Dies and our audience continues to grow steadily, so I would suggest there is a hungry audience for what we do, and this may be a reaction to the increasingly disposable nature of a lot of music-related media. Despite there being a number of bands that are still alive from the dawn of the 90s, which bands from current times do you think will be able to boast a career or lineage like that of Rotting Christ, Mayhem or Darkthrone for example? Sakis Tolis: Samael, Paradise Lost, Immortal, Marduk, and Moonspell are some of the bands I can remember now that are here in the scene, unstoppable since day one! Dayal Patterson: Ah, that is an interesting question. All those bands you mention formed in the 80s, and I suppose other bands who formed in the same era or soon after could be added quite comfortably, for example, Marduk, Moonspell, Napalm Death, Paradise Lost, Autopsy, Morbid Angel and so on. In terms of later bands that look set to stand the test of time and keep going for years to come... I guess some possible contenders would be Watain, Satyricon, Behemoth, Enslaved, perhaps even Mgla, Shining or Taake. 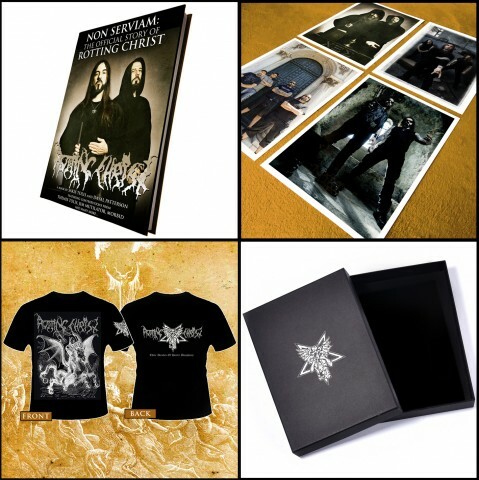 Noizr: "Non Serviam: The Official Story Of Rotting Christ" is now available for pre-order via Cult Never Dies. Follow the project's page on Facebook. "Non Serviam" will be released November 30, 2018. It will be available in both standalone paperback format and as a signed box set including a color hardback edition of the book, embossed box, exclusive shirt, a 12 piece set of 350 gsm art prints, certificate of authenticity signed by Sakis and Themis Tolis and one more item to be announced.